As the economy shows signs of renewal, the continuing crisis in the housing market remains a drag on economic growth. Continuing issues with foreclosures, paperwork, and loss of homeowner wealth threaten to short-circuit the recovery unless policymakers can offer reasonable solutions to stabilize the market long-term. 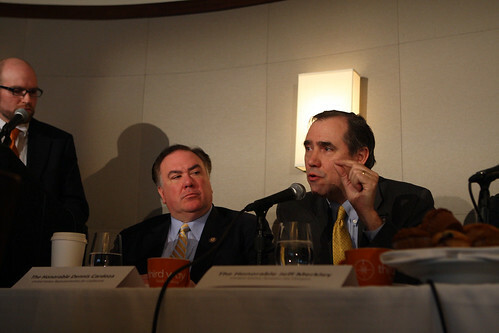 Third Way’s Domestic Policy Program hosted a breakfast and panel discussion on the short-term and long-term challenges still facing the nation’s housing market and why policymakers must act. Featuring Oregon Senator Jeff Merkley, California Rep. Dennis Cardoza, noted housing economist, Mark Zandi and Columbia University’s Chris Mayer, and moderated by The New York Times reporter Binyamin Appelbaum.